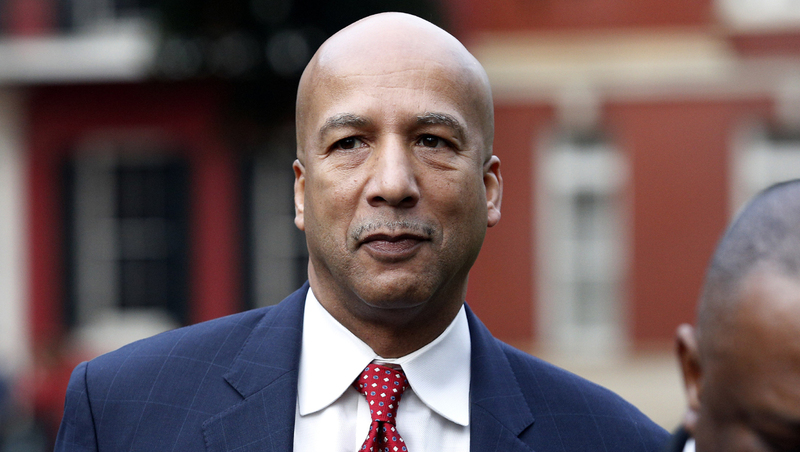 NEW ORLEANS - Former New Orleans Mayor Ray Nagin reported to a federal prison in Texarkana, Texas, on Monday to begin serving a 10-year sentence. Nagin arrived at the facility shortly before noon. New Orleans television stations showed images of Nagin hugging family members in a parking lot before he entered the lockup. The Bureau of Prisons operates a low-security prison there with an adjacent minimum security camp. Bureau spokesman Chris Burke said Nagin reported to the minimum security camp. In February, Nagin was convicted on 20 counts including bribery, conspiracy and money laundering stemming from his two terms as mayor, including the chaotic days after Hurricane Katrina hit in 2005. A Democrat, Nagin had been elected as a reformer when he took office in 2002. But prosecutors said graft in his administration began before Katrina and flourished afterward. Bribes included money, free vacations and truckloads of free granite for his family business. Re-elected in 2006 despite growing dissatisfaction with the city's recovery, he left office in 2010. A public defender in New Orleans is pursuing an appeal of Nagin's conviction. Assistant Federal Public Defender Jordan Mark Siverd recently was appointed to the case after Nagin's previous attorney, Robert Jenkins, said the former mayor was unable to pay him. U.S. District Judge Helen Ginger Berrigan had approved the appointment of a public defender. According to a questionnaire filed with the court, Nagin had just $23.65 in the bank and numerous debts. Nagin reported to prison the week after his former technology chief and deputy mayor, Greg Meffert, was sentenced to 2 ½ years, for his role in the corruption. Meffert had faced a possible eight years but prosecutors urged a lighter sentence and praised his cooperation in the case against Nagin and others. Another key figure who was convicted in the case, technology vendor Mark St. Pierre, last week won a reduction of his original sentence of 17 ½ years. Because he helped prosecutors after he was convicted, St. Pierre's sentence was cut to five years.